If you've used HomePlug powerline products, you know how to set up G.hn products. All devices come with a default network password of HomeGrid (G.hn calls this a "Domain Name"), so will pair up when you plug them in. If you want to prevent other adapters from connecting to yours, or if you want to create multiple networks, you use a pushbutton pairing sequence, just as you would with HomePlug. Arris has dispensed with the usual application-based administration for the SBX-1000P, instead letting you control the product with any web browser. All adapters default to http://192.168.100.254, so you'll need to change the IP address of the device you use to access the SBX first. A successfull login will take you to the Status screen shown below. You can also use the utility to set the encryption key (aka password) if you don't want to use the pushbutton method. The gallery below steps you through the other available administration screens. This screen shows status information. Adapter IP address can be set here. Firmware can be upgraded here. G.hn settings. Note the different RipCurrent profiles. The PLC 50MHz_MIMO_BOOST is the default. The SBX-1000P was tested using our standard powerline test procedure, with all results entered into the Powerline Performance Charts. I included the only other G.hn adapter we've tested, Comtrend's PG-9172 and TRENDnet's TPL-421E2K top-ranked HomePlug AV2 adapter. 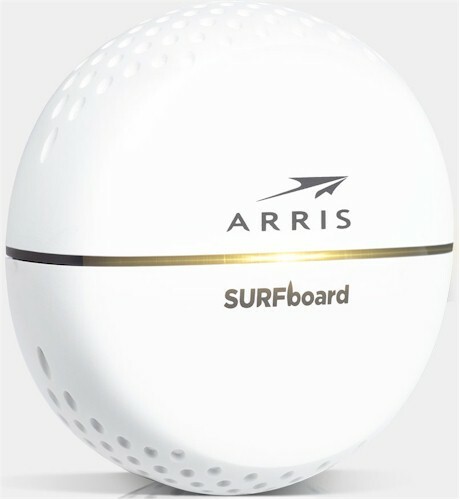 Since Arris sent only one SBX-1000P, I used the SBR-AC1900P router as the test companion device. The Downlink Throughput plot below shows the SBX-1000P's throughput lower than the Comtrend's in all locations. The TRENDnet beats both G.hn adapters by a lot in the Location A same-outlet test. Uplink results are similar to download. Note for uplink, Location E throughput was higher than Location C for the Arris. This is unusual, since Location E puts the most distance between adapters, with lower throughput as a result. The simultaneous up /downlink IxChariot plot for the SBX-1000P at Location A shows relatively low total throughput of 321 Mbps compared to many HomePlug AV2 products. Throughput was at least fairly evenly divided between the two directions. Add a second up / down pair to the test run moved total throughput up to 337 Mbps, a 5% gain. The downlink composite IxChariot plot of all tested locations shows fairly consistent throughput in all locations. The composite plot below compares the baseline Location E downlink test (run with all noise sources unplugged) with a run a test run with a single noise source plugged in, then unplugged at the 30 second mark. I also added a plot with all noise sources plugged in. Throughput appears to start rising to top no-noise-source trace at 25 seconds, even before the single noise source is unplugged. So it appears there is some noise adaptation mechanism at work. I treat G.hn as a different powerline class, so it stands alone in the Powerline Ranker. But if you filter the Powerline Charts to show only G.hn and AV2 MIMO products, you'll find the the SBX-1000P average performance at the bottom of both average downlink and uplink charts. In contrast, Comtrend's PG-9172 does much better, landing in the middle of the charts with average throughput around 200 Mbps vs. the Arris' 150 - 160 Mbps. Arris' endorsement of G.hn technology notwithstanding, I'm still fairly bearish about G.hn's prospects as a mainstream consumer alternative to HomePlug. I think it's more likely to go the way of MoCA, with more widespread adoption by service providers. Consumers wanting to try G.hn adapters will have to settle for Arris' products or search eBay or troll Amazon's selection of smaller resellers for Comtrend's G.hn adapter. My recommendation remains to try G.hn only if you haven't had luck with a pair of HomePlug AV2 MIMO adapters. And I'd try Comtrend's PG-9172-KIT vs. the SBX-1000P, since it performs better at half the cost.